This converted the Porters' Lodge from a small cozy space in the Fisher Building to an almost too large area in front of that. There was also added, at the right, a Cloister connecting the Porters' Lodge to Cripps Court. 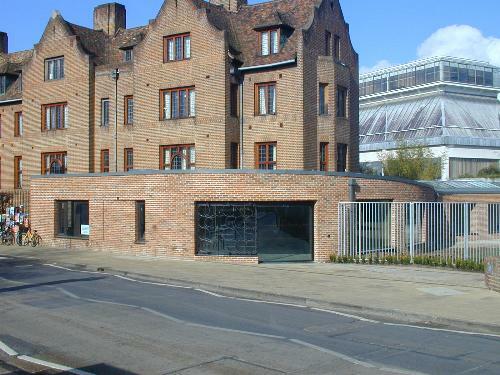 And, in the usual Cambridge way, the car parking in the area between the Porters' Lodge and the Mathematical Bridge was removed, replacing it with a grass and stone area which serves little purpose because it lacks privacy or even a proper setting.